Which would you choose as the King of Fruits? 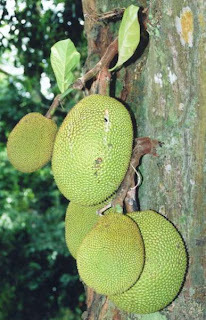 My vote is for jack fruit – I know some of you may not agree with me. But believe me it is – in size and majestic appearance and sweetness. Tough externally and silky smooth internally. And during one of my Google searches, I discovered the many health benefits of the jack fruit, so I'm convinced that my loyalty is not misplaced! Of course it demands some arduous efforts on your part to enjoy the pieces. This might put some off – damn the stickiness and need for oiling your knife and palms. (Nowadays the fruit vendor does all this sticky business for you while you wait patiently.) Another thing - you simply cannot hide the jack fruit at home – so strong is its ‘odour’. Don’t even think of shoving it in the fridge – the odour will permeate the entire items in it even if it is kept in a closed container! For the same set of people (I mean jack fruit-haters), this odour is a repellent But not for me! Oh I simply love the fruit! Partly because I am a Keralite; also because I've stayed a very small fraction of my life there – four years to be exact – in the mid-sixties! I was staying with my grandparents and aunt in Thrissur as my father was posted in the remote Port Blair (Andamans) and there was no high school there in those days! Come summer vacation, and I’d be ready to pack my bags to visit my parents and siblings. But not before relishing a week of jack fruit! I’m not ashamed to admit my greed – I had to gulp all the jack fruit I could for the season in just a matter of days. My grandma would cut up a gigantic jack fruit and give me 1/6 of it. I’d tell her I’d help myself to the ‘chakka thundam’ all through the day! She’d keep aside another similar piece. I’d ask her what that was for. She would say that was for the maid. Selfish me – I would try to remind her I’d be eating more the same day and the next day too …. And she would reassure me there was plenty! And sure enough I’d gorge on my favorite fruit for some 10 days – sometimes dipping them in honey – hmm…love them that sweet …. Oh those were the days! The elders at home were no big fans of the fruit as such but were more interested in the dishes from jack fruit – they called them ‘chakka series’ – starting with ‘chakka molagooshiam’ (with almost raw big jack fruit, graduating to ‘chakka puzhukku’ the next day and to the sweet ‘chakka curry’ (which was the only one I was interested in) as the cut jack fruit ripened. Not to forget the tasty 'chakka kuru' (jack fruit seeds) used in 'mezhukkuvaratti' and most 'koottaans'. Before and after that period, I’ve never got to eat SO MUCH of ‘chakkapazham’! Except a couple of tenures in ‘jack fruit-infested’ Bangalore and Pondicherry, my dad’s postings were in ‘jack fruit-forsaken’ places. And during such times, we had to rest content with ‘chakkavaratti’ (jack fruit halwa) lovingly stored by grandma for our annual visit. My, wouldn't we simply enjoy the extra large helpings she would hand over to us kids! We loved to dig the spoon into the tempting brown halwa, pick up just a wee bit and lick and let it remain on our tongue as we savored its yummy taste! Hubby has a favorite anecdote about the jack fruit – and I love it too! He had a big group of Mallu friends in his bachelor days in Pune. A couple of them would want him also to accompany them on their scooter to Pune railway station. The foursome would wait for the particular train from Kerala – we forget what it was called in the late 60s. As it arrived on the platform, the friends would take out a piece of paper with some numbers scribbled on it and look for the particular bogey. On locating it, they’d enter the compartment and look for the particular seat number. They’d put their hands under the seat and pull out two huge jack fruits lying there and alight with them from the train. The pillion rider would hold on to the jack fruit as they rode home! The story unfolded before hubby like a jigsaw puzzle! The jack fruits had travelled WT all the way from Thrissur to Pune under a particular seat in a particular compartment. The relatives who had sneaked in the jack fruits had sent the bogey and seat numbers by telegram (remember those were the days – RIP telegram!) to the Pune guys. None of the passengers suspected that the jack fruit was nobody’s – each thought it belonged to one or the other passenger. Nobody bothered who collected it as it wasn't anybody’s and didn't suspect when somebody collected it! It happens only in India! The relatives were happy to send some home-grown jack fruits to eager fans and the latter equally thrilled to receive them – and if it was achieved free of cost, the joy of both the parties was doubled! Post-marriage I have been in Pune – this city had been a ‘No Zone’ for my favorite fruit – till the dawn of the millennium or a little earlier! Pune has undergone tremendous changes for the better in every respect, including availability of all fruits in plenty in every part of the city and suburbs – and the jack fruit is no exception! Now that I’m a grandma, I prepare ‘jack fruit halwa’ and await my grand kids! (The only difference is my grandma would have a bottomless jar of it (remember those were the times of home-grown jack fruits and stay-at-home cooks!) and I have 3-4 small containers with my several batches of the ‘chakkavaratti’ (poor me – I have to make it on my own steam, so I make in installments - with a little more than one kg of jack fruit every time!). Last year my friendly neighborhood jack fruit vendor (he makes his appearance just during the season!) had loads of good jack fruit till mid July – so when my grand kids came down from the US, they got to eat the ripe fruit and give their vote in its favor. They were also overawed by its size and its ‘poky’exterior! My elder son and family landed a week too late but they had jack fruit awaiting them on the tree at the other grandparents’ house in Chennai! So that was about last year. This year our friends Padmini and Aravind brought us my most precious gift on their return from Kerala in early April – no prizes for guessing! Yummm …. So many whole pieces embedded in that ‘chakka thundam’ – about 1/6 portion of a whole jack fruit! We chomped on them as such. Come Vishu, and I presented myself at the Kerala Store and bought 1/5 of a whole chakka and decided to use a part of it for chakka pradhaman. But when I was done removing the ‘chakka chola’ (whole pieces) I realized that the number was half of what I had managed to get with Padmini’s! So you see, you can never be sure what lies within the jack fruit! After that, there was no sight of jack fruits at all for more than a month. And here I was biding my time to make ‘chakkavaratti’. Finally they appeared around the street corner and with a vengeance I had a go for it, grabbing 1 ½ kg each time (other buyers would give me dirty looks as they’d have to wait patiently in queue for their ¼ kg buy!). I remembered the tasty sweet ‘chakka curry’ my aunt would make some 45 years ago and tried it out (I didn't know the recipe but guessed it recalling its taste!). I made just a little quantity as I wasn't sure hubby would like it – but then we almost ended up competing for it! So I repeated the same three times and now I’m feeling so good. We don’t normally buy jack fruit once it starts raining – the belief is water enters the fruit and reduces its sweetness. But our counterparts from the North are of the opinion that it tastes better after the rains! Diversity! Awaiting jack fruit in the next season, I chose to pen this ode to jack fruit. P.S. Hey, wait! This season is not over – not yet! My neighbor Valsa who had gone to Kerala by car, returned yesterday and …..yes, sent me ¼ of a home-grown jack fruit. Yippee – I got to take photos of the 'chakka thundam' (portion), the messy 'chola-extracting' business and 'chakka chola'.